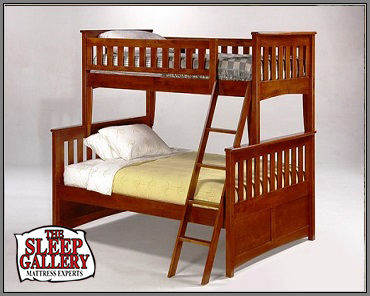 The Sleep Gallery offers all of the best kid's beds and furniture to empower their dreams. One of the biggest items desired by parents and kids alike is a bunk bed and The Sleep Gallery knows all about today's bunk beds. We also know that when the kids sleep great, you sleep great and everyone wakes with a smile on their face and a spring in their step. Great sleep also brings better performance in the classroom, which also adds to the smiles. Kids also feel better when they have a personal space, such as their bedroom, that is personal to them. Need a bunk bed that offers both a sleeping space and some storage and a study desk? We can offer you a few different options that can help with that. How about a small bedroom where two kids need to share? We have traditional bunk beds that can include some clever storage areas and different configurations to make the room functional and stylish. Depending on the specific need of your room, a Bunk Bed can solve your space problem while presenting a stylish and functional bedroom solution. If you do not need storage space or a desk for studying, you can get a Futon Bunk Bed that will provide the standard bed up top and a futon bed below. This will provide a sleep space and a sleep or sitting space that is versatile for all sorts of needs. Standard Bunk Beds offer a bed on the upper level and a bed on the lower level. A ladder is used to reach the upper level. You can also vary the size of the beds and/or use a combination of sizes. For instance, you can get a standard bunk bed with a twin on top and full on the bottom. Or you could get a full size bed up top and a queen size on the lower. You can pretty much create the ideal bunk bed by being creative. A Loft Bunk Bed offers a bed on the upper level and a ladder, but no lower bed. You can have a bookshelf, or open floor space, or a desk, or some other type of storage furniture. Loft Bunk Beds are suited to the single person bedroom that needs to maximize the space and have a study area underneath. Give us a call or stop by to discuss your specific needs. We are here to help. and exceptional customer care. Let us makes your dreams come true! We have the area's largest mattress selection, while offering the highest quality name brands at unbeatable prices. Our factory trained sleep consultants can assuredly help you find the perfect night's sleep. The Sleep Gallery is Tallahassee's Mattress Experts!